I woke up to see a note from my son in the bathroom, informing me he had vomited during the night. Be glad I spared you the full sight of the sink next to the note, which left no doubt of WHERE he had barfed. This aroma ought to really entice the potential home buyers! Our time in Alaska is coming to an end and we will be moving on soon. listing the house for sale. This is not my favorite thing to do, of course, since it involves a lot of cleaning up. I want to give the impression that this house is easy to clean and maintain, making it more desirable to buyers. Still, I have been decluttering and straightening and all of that, and recently the real state photographer came to take pictures of the house. I answered the door looking like a crazy person, blurting, “I’m-not-quite-done-with-the-kids-rooms-I’m-really-sorry! !” It was like five degrees outside but I was sweating like a pig. The photographer was very calm and said she’d start downstairs and give me time to finish upstairs. She has probably dealt with crazy homeowners before. By the time she came upstairs, I had finished. Fortunately. She photographed the upstairs and I watched nervously. Then, oddly, the cat come out to see her. This is odd because our cat NEVER comes out when people are over. He hides because he hates people. Seriously, he hates everyone in the world except my husband, whom he allows to pet him. But here was Kitty, meowing and rolling over adorably and clearly wanting to be petted by this complete stranger! I told her the cat never acts like this, and he must like her for some reason. Oh. So Kitty was manifesting his hate THIS time by NOT hiding. Anyways, she left rather quickly, and she must not hold a grudge because the pictures came out great! Does anyone remember to thank Mom? Posted on February 15, 2018 March 26, 2018 Categories RandomLeave a comment on Does anyone remember to thank Mom? Here’s a news flash: I’m tired. No, seriously. I am really, REALLY tired. Maybe there is something wrong with me, or maybe all mothers feel like this, but, most days, all I really want is a nap. That’s actually my entire goal for the day. A NAP. My kids are not on board with this. They want me to be awake and doing mom stuff. You know, like serving them. Still, whenever I can, I go to my room and try to take a nap. I do not need the house to be quiet for this. I can sleep through the noise. I don’t even have to close the bedroom door. But unfortunately, the kids still want stuff. Some of the things they want I can do without much trouble. You’d be surprised what I can accomplish while lying down with my eyes closed. Sometimes they don’t really want me to do anything at all; they just want to pretend to have informed me of things they’re not too keen to talk about. But sometimes, they simply WILL NOT be ignored. Sigh. I guess I’ll get up and do some mom stuff. I saw this on Facebook. I guess it’s supposed to be inspiring? I accidentally left wet clothes in the dryer overnight. You know how sometimes you transfer the wet clothes from the washer into the dryer and then forget to switch the dryer on? When you do that, the clothes do not get dry. Amazingly enough. Anyways , the next morning when I looked in the dryer, the wet clothes had frost crystals all over them. I’m not kidding. Jack Frost had been in my DRYER. This is because there is a small vent to the outside, apparently, and temperatures have dropped below -30 recently. I guess I should be glad I don’t have to dry my clothes outdoors! I was browsing Facebook after Christmas and I saw a picture of my friend’s young son with a toy rifle in his living room. It was captioned something like, “He sure loves his Christmas present.” The kid was next to his father, who was showing him how to sight down the barrel. 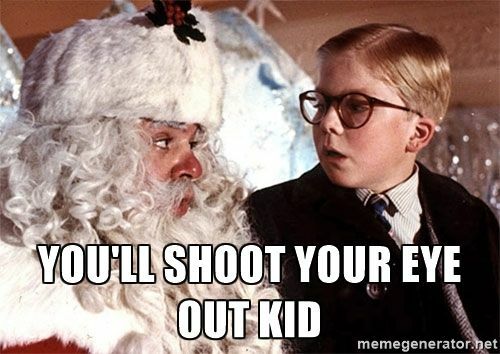 Of course, I immediately thought of Ralphie in “A Christmas Story,” and the air rifle he wanted for Christmas. I thought that was pretty clever, but apparently my friend didn’t. I guess it was offensive? I’m not even anti-REAL-gun! I’m from ALABAMA, for crying out loud! Anyways, my ex-friend, if you’re reading this, I’m sorry. I’ll try to be less offensive in the future. I was planning to take a bath later in the evening so I put my hair up on top of my head in a big clip before reading a story to my son, aged 9. This hairstyle is called a “messy bun” when worn by models or celebrities, by the way. I’m not sure what it’s called when I wear it, though. I’m sure he has my best interests at heart. Posted on December 14, 2017 December 19, 2017 Categories Kids2 Comments on Useful Advice? I saw a certain ridiculous advertisement on my Facebook wall. Just HOW does this solve the problem of having multiple kids? Does it help moms grow extra arms? Can it help restore a mother’s lost sanity? At the very least, will it block some of the horrific noise generated by multiple children? No? Then WHAT GOOD IS IT?!?! ?